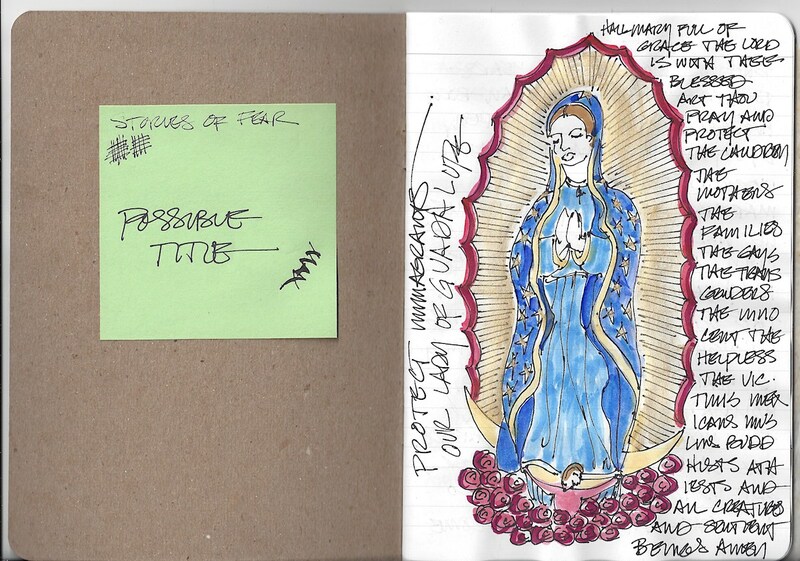 I am participating in the Sketchbook Project this year. This year is that they have assigned topics. You choose FEAR or HOPE. Being a creative type I picked one but am not following it. I am doing Fear AND Hope. when I read ANYTHING these days in the political news, I decided to take this on. which brings us to one of the reasons I need to write about Fear and Hope. So I start, and see where this takes me…. Let’s see if I can get to the hope by starting with the fear…. and I hope you all decide to join me once a month in that… drum-roll to come. after paying my money and getting their idea of a sketchbook I returned it. and AT LEAST paper where every dang page doesn’t bleed through. it is journaling and I want to be part of a national conversation. To hear about classes on daily art journaling, follow me on Facebook! Sennelier and Daniel Smith Watercolors. This entry was posted in art, autobiography, courage, journal, loss, sketchbook, writing and tagged fear, Hope, Sketchbook Project. Bookmark the permalink. I’m with you on Fear AND Hope. They walk together for me. Otherwise, the topic is simply too sad right now…. I never thought about adding drawings to journaling. Great idea. BTW, are you going to join us for We Are The World? I’d like to post, but with the new grandbaby coming in the next few weeks, I’ll be occupied with taking care of our granddaughter for a while. I’ll will hopefully start participating in May. A new Grandbaby! Yay! Who can fault you for that! We intend to keep this up for awhile… uplifting is always welcome. BTW, I like the haircut!